Keurig k200 vs k250 which one should you buy? If you are looking to treat yourself to a new Keurig brewer or are wishing to trade up from the K50 or K55 then your next best option is probably the K200 or K250. If you really want to up the ante and go for an even bigger brewer then you should take a look ​at the Keurig K475 or K575. The K200 and K250 are pretty similar machines and there is not a huge amount of difference between the two. The Keurig K200 range is the next step up from the K55. It has a 40 ounce reservoir which equates to five servings at eight ounces each. Not only does it accept the conventional single serving pods(K-Pods) it can also utilize the K-Carafe allowing you to brew a larger m​ore traditional pot or "carafe" of coffee. The carafe has a capacity of thirty two ounces or roughly four cups and you have a choice of either plastic or stainless steel. Just be aware that the carafe is sold separately. ​On the K200 you will find a strength control feature that allows you to control the intensity of the brew made regardless of which size pod that you use. The K200 and K250 are the smallest models with this feature. You can also dispense hot water from the K200 without having a pod inserted, which is a nice additional feature. The K250 is basically a newer model of the K200. Keurig has done this time and time again throughout their range of brewers. In an ideal world it would just retire the older model and reduce the confusion. But how exactly do they differ? The K250 comes with a few more accessories than the K200. Included with the K250 are two water filters, a water filter handle and a bottle of descaling solution. 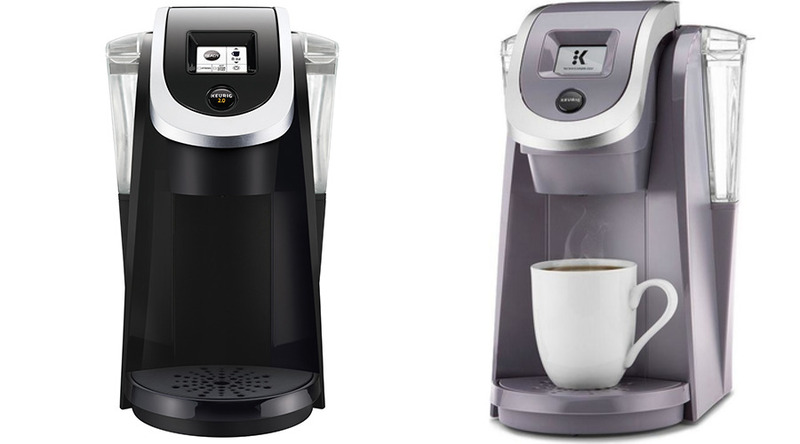 ​Just what what are the differences ​between Keurig K200 and K250? The only differences between the K200 and K250 are the additional accessories included with the K250. That and some very subtle differences in the look of each model. keurig k200 vs k250 which is the winner? For us the K250 is the clear choice. It has the water filter and descaling solution already included in the box.